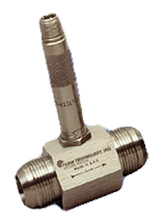 The Amplifier Link, which is compatible with most manufacturers turbine flowmeters, combines a pickoff with a signal conditioner in one compact, low-weight design. It produces a 0.5 VDC pulse output which can be transmitted over long distances. Either magnetic or modulated carrier (RF) electronics are factory selectable.